A luminescent area the size of the state of Connecticut was shown to have occurred in the Indian Ocean. "The circumstances under which milky seas form is almost entirely unknown," says Steven Miller, a Naval Research Laboratory scientist who led the space-based discovery. "Even the source for the light emission is under debate." "So, our best working hypothesis is that we are witnessing bioluminescence produced by bacteria that are colonizing some kind of organic material present in the water," he said. "Satellite detection will hopefully allow us to target milky seas with properly equipped research vessels that will then be able to answer all these questions definitively." My companions and I then witnessed a curious spectacle. The hatches of the saloon were open, and, as the beacon-light of the Nautilus was not in action, a dim obscurity reigned in the midst of the waters. I observed the state of the sea, under these conditions, and the largest fish appeared to me no more than scarcely defined shadows, when the Nautilus found herself suddenly transported into full light. I thought at first that the beacon had been lighted, and was casting its electric radiance into the liquid mass. I was mistaken, and after a rapid survey perceived my error. The Nautilus floated in the midst of a phosphorescent bed which, in this obscurity, became quite dazzling. It was produced by myriads of luminous animalculae, whose brilliancy was increased as they glided over the metallic hull of the vessel. I was surprised by lightning in the midst of these luminous sheets, as though they bad been rivulets of lead melted in an ardent furnace or metallic masses brought to a white heat, so that, by force of contrast, certain portions of light appeared to cast a shade in the midst of the general ignition, from which all shade seemed banished. No, this was not the calm irradiation of our ordinary lightning. There was unusual life and vigour: this was truly living light! Bioluminescence in sea water has been remarked upon since ancient times; seas that seemed to be on fire were reported as early as 250 BC. The specific speculation that some tiny sea creature too small to see caused the light was made about a century before Verne wrote his novel. Benjamin Franklin wrote in 1753 "It is indeed possible, that an extremely small animalcule, too small to be visible even by the best glasses, may yet give a visible light". The data was gathered in 1995; it was reported in the Proceedings of the National Academy of Sciences this past week. 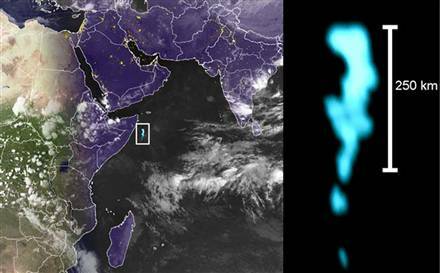 Read more in Satellite images confirm mystery glow in ocean.